"Come Sail Away with Captain Don aboard the Tupelo Honey! Based out of Boston, Massachusetts, Tupelo Honey is a beautifully crafted, Coast Guard certified, 31' Friendship Sloop licensed for 12 passengers and 2 crew members and is always ready for a sail! 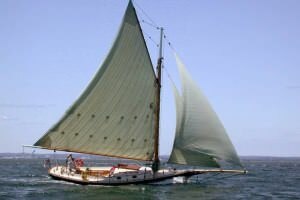 Everybody can sail on the Tupelo Honey around Boston Harbor, with no experience necessary! Captain Don offers 2-hour harbor tours in addition to Boston Harbor Island Tours. You can experience and explore all Boston Harbor has to offer aboard the Tupelo Honey. You can also book private charters that can be scheduled to fit your needs. You can celebrate birthdays, anniversaries, graduations, and engagements with a sail aboard the Tupelo Honey. Your business can participate in corporate team building charters where co-workers will learn how to work together to achieve a common goal. Chartering a sailboat can even turn everyday activities into a new and exciting adventure. Why have a mundane picnic in the park when you can have a beach picnic, complete with a sail around the harbor! Another boring family reunion can turn into a first annual family sail. Anything is possible with Captain Don aboard the Tupelo Honey! Sailing lessons, from beginner to advanced, are also available. You will learn basic boating skills in an easy and safe environment. Skills such as boat handling, navigation, wind speed & direction, tides & currents, anchoring, and plotting a course."